Well, it has come and gone, Thanksgiving. Today will be a tribute to one of my favorite holidays. Why would it be a favorite? Besides the obvious reasons, like giving thanks and all of that nonsense, it is a holiday that is based upon one thing, eating. Whatever genius thought up this idea, I want to say thank you. A side note: you are not, I repeat, you are not white trash if you prefer cranberry sauce that comes from a can. I am huge fan of the stuff that comes from the can. Unfortunately, I have family that enjoys the culinary arts, and refuses to put this item on the table. Instead, I have to choke down the actual fruit, skin and all. Along with the wonderful meals created on this holiday comes another special treat, leftovers. Yes, days of fun. With the leftovers, you can create your own dangerous recipes, mixing and matching various meats and veggies. You may create the hoagie (sub, hero, depending on your region) of the century. I think that any sandwich that you can add mashed potatoes to has got to be heaven. Along with the traditional leftovers, I had a new item added to the list of weekend goodies. My wife found awesome cashew recipe. It is a recipe of the bar nuts served at Union Square Cafe in New York City. Did I mention that they were awesome? Okay, this is not a cooking blog but I will tell you what they basically consist of. 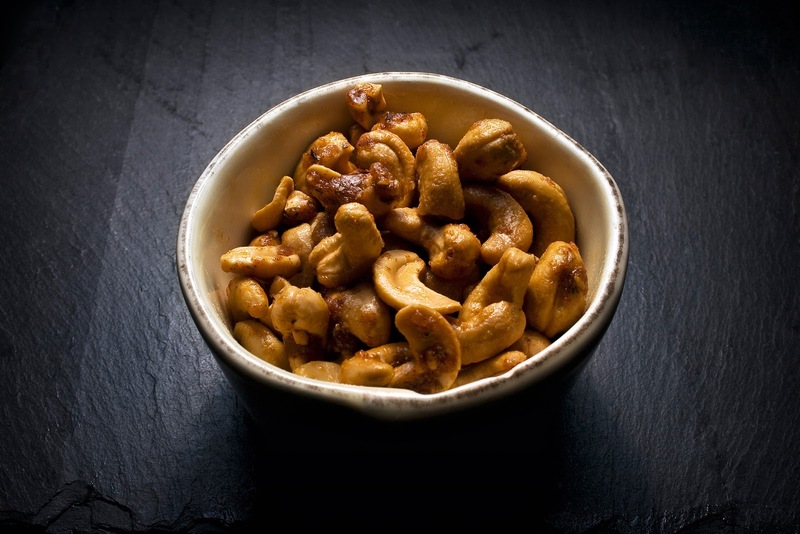 The cashews are baked with fresh rosemary leaves, cayenne, kosher salt, brown sugar and butter, served warm. I'm getting weak in the knees thinking about them. The taste is so unique, sweet, spicy, savory, salty, all at once. Hit [me] to get the recipe. With the abundances of leftovers around the house, I couldn't resist shooting some food product for today's post. And since I could not get those damn cashews out of my head, they became my subject of choice (I had to refill the bowl a few times). To make absolute use of Thanksgiving leftovers, I decided to use a translucent Tupperware cake lid as my light mod, in place of a white shoot through umbrella. Now that's white trash. Eat your canned cranberry hearts out. I used a cake lid as a light mod!!! Yes, you heard right. It even had a faint odor of pumpkin pie. Creative improv is essential in photography. Use what is available, and the results can amaze you. I chose the slate board to place the bowl of cashews on. I thought the slate had nice contrasting textures when compared to the nuts. I also liked the slight reflectiveness that I would use to my advantage in the shot. The bowl is straight from the kitchen cabinet. Not your traditional circular bowl, I thought this would also compliment the scene. I also had little choice in the matter since all of our dishes, bowls, etc., have this odd shape. I placed the camera on a tripod. I don't usually go this route unless necessary, and today it was necessary. Why? 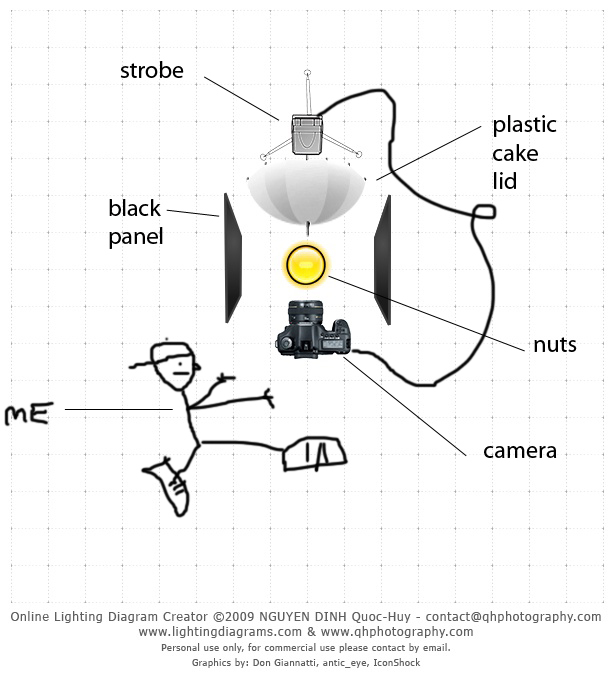 Unfortunately, I did not have the proper equipment to attach a cake lid to a speedlight. The remedy to this problem was to hand hold the light modifier, and trigger the shutter via my wired trigger (I prefer this trigger over the wireless since it has more functionality). The 15-85 lens is capable of focusing at relatively close distances. I shot at 24mm at approximately 12 inches from the subject. I may have even been closer, not exactly sure, but we will call it a foot for the article's sake. As mentioned earlier, I had two black cards on either side of the subject to catch any unwanted light. Behind the subject was the light. This was also placed very close to and above the subject at a 45 degree angle. At this point everything is ready to go. I just had to dial in my exposure and light settings to get a pleasing shot. First things first. Unless I need a higher ISO, I always try to keep it at ISO 100, as I did here. This setting will give me minimal noise. I don't mind going up to 400, but beyond that is getting into dangerous territory (with my specific camera). Next, I was thinking of my aperture. 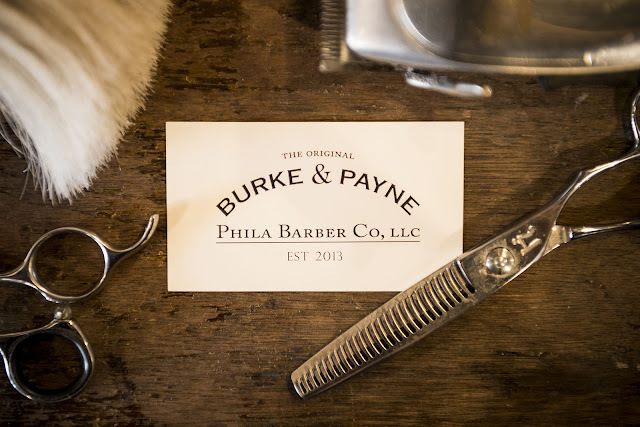 I wanted everything nice and sharp, so I cranked that baby all the way down to a small f/11. This aperture will get things nice and sharp, but will also require more light power. I wasn't worried about that since my strobe was in very close to the subject. Shutter speed was at its sync speed of 1/200th of a second. Ultimately, I had to set the flash to 1/32nd power to get the light I was looking for. I mentioned that I want to pull out all of the textures in the cashews. I also wanted to capture the texture of the slate board. This was all done by the position, power and quality of light. I fired at a low power very close to the subject and at an angle. What this does is rakes the light across the subject. Raking is a technique geared at bringing out a subject's texture. Had I lit the subject from the front or slight camera right/left, the texture may have been lost due to some shadows being lost. Lighting from above and behind will create shadows in certain edges, giving the nuts the much needed depth. You will also recall that I said that I chose the semi reflective slate board for a reason. Take a look at the soft glow coming up from around the bowl. I wanted to create some separation between the bowl and the slate. 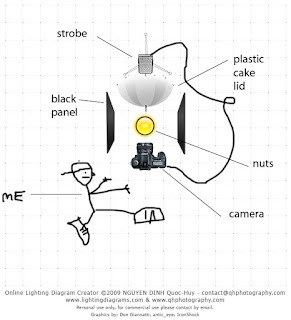 This could have been done by using a second flash, from another angle, but I felt that I could achieve that same effect by spreading that light with the cake modifier. If I shot bare bulb, the nuts would have had nice texture, but the slate would have been dark and depth would have been lost. Although it is not white trash to eat canned cranberry sauce, it may be white trash to use a cake lid as a light modifier. That's OK too. Just be sure to use an actual softbox or umbrella or other professional light mod while at a shoot with other people standing close by. I did this shoot at home, the only others in the house were wife and dog. Neither paying much attention to my strange work. Also, I used the cake lid as an experiment, I wouldn't think of bringing it to an actual shoot, well, maybe I would, but I would try not to. I noticed the lid lying around, and could not help but think that I could make some interesting light with the thing. And I did. Now, I think I'm going to make myself a turkey and mashed potato hoagie, with a large side of cashews.